Auction Results charity auctioneer news and press releases. NBC feature news story. $250,000 in 60 Minutes - All in a night's work for charity auctioneer David Goodman. Record Breaking Party. Auctioneer for Alturism. Want to meet the Pope or swim with Phelps? Hello Americans, This is Paul Harvey…. Live auction raises an incredible $270,000! Live auction raises more than $150,000 and Grammy Award winner Gladys Knight entertains at the end! 3rd Annual Night of Dreams Gala a success! Gold Coast Fashion Awards Raises $1.1 Million! Chicago Children’s Museum Gala –Learn Together a Success! All Together Now for CCM! Auction Swings Into Action For Chicago Symphony Orchestra Programs! A Swingin’ Auction, was – well – a swinging success. Goombay Bash Has Record Turnout to Fight Cancer! The annual event raised hundreds of thousands of dollars! McLean Orchestra Midnight In Paris A Success! The Friends of Conservation Ball Really Upped the Ante! Mission Possible Was A Success!! Juvenile Protective Association breaks fundraising record! Record Breaking Wish Ball Raises $2 Million! 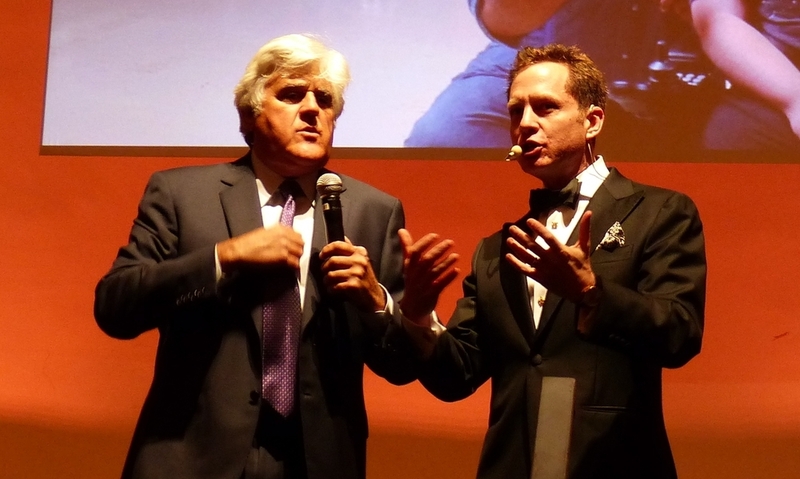 Jay Leno with Auctioneer David Goodman raises almost $1,000,000 during live auction! All Charities Weekend: Off The Charts Again! CEW “Beauty of Giving Luncheon” raises $583,000! Magic Ball Raises over $1,000,000! Out of This World! Cosmosphere Raises and estimated $150,000! "Camp Night" Lifts Young Lives"
I would like to express my gratitude and admiration to David Goodman & Auction Results. I knew you would impact our numbers, but not by the level that you accomplished! The Live Auction and Paddle Raise brought in almost $1,000,000 this year! YOU are MAGICAL!! “I am thrilled to say that partnering with David resulted in our most successful fundraising event ever!"